We can all be forgiven for sometimes forgetting how incredible the Civil Service really is. For my development plan it was agreed that I would shadow prominent senior leaders to help build my strategic management and leadership skills. As a proud ethnic minority senior civil service member working in the Cabinet Office, I am very eager to further my capability and progress within the Civil Service. Work-shadowing senior leaders can offer deep insights into their roles through intense exposure to their work, key activities and style, helping the observer to build new skills, transfer existing ones and broaden career horizons for future roles. I wanted to pursue a work shadow opportunity that would combine my policy and strategy interests, past experience in the UN and current NED roles at UNESCO (UK) and Concern Worldwide. I decided to aim high and asked the British Ambassador to the UN in New York – the amazing Matthew Rycroft – if I might work-shadow him. As a true inspirational leader he kindly said yes, and helped me to secure a work-shadow day with UN Women too! Within a few short weeks it was all arranged. 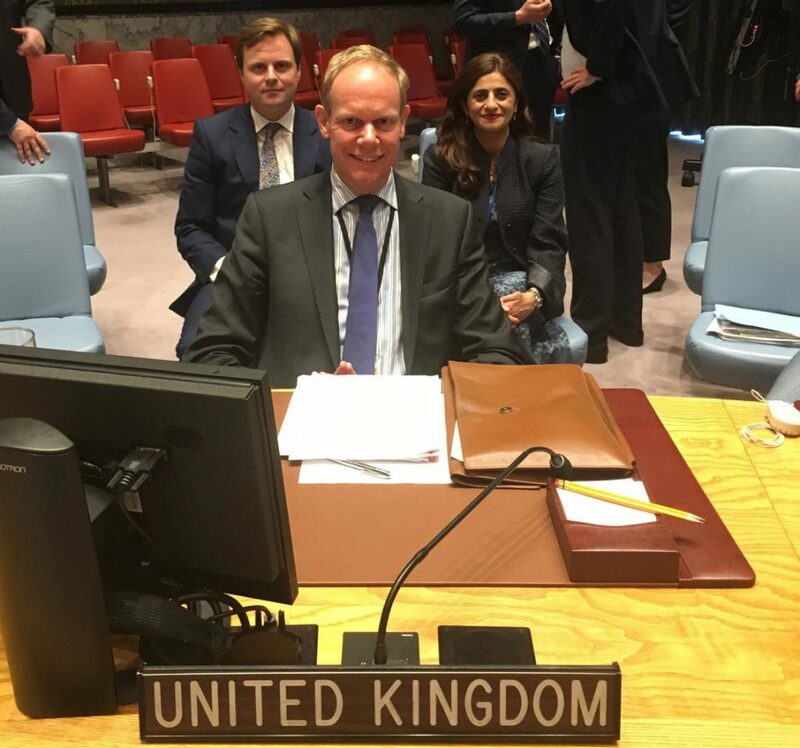 I spent three days at the British Embassy, accompanying the Ambassador to the UN Security Council (UNSC), where he gave a key speech on Libya and engaged in bilateral discussions with fellow ambassadors and their teams – we sit next to the US at the UNSC! I also attended the Ambassador’s UN press briefing, where the UN press corps are invited to put, often difficult, questions to the Ambassador – they covered human rights and conflict issues, and how the UK will respond. Then I sat in on internal senior managers’ meetings, corporate and team meetings at the embassy and learned how the team are preparing for a milestone event in their annual calendar, the UN General Assembly, and other important strategic issues. I was able to observe first-hand the Ambassador’s leadership and strategic style in handling diplomatic, crisis and management issues, including the UK’s position on strategic issues, leading a high-performing team and championing an engaging and creative culture across the organisation. I also spent time with the senior embassy team, learning about their work leading on human rights, UN reform, diplomatic communications and political engagement. In between high-powered meetings, the Ambassador shared how he handles daily tasks such as preparing for speeches and meetings, managing formal correspondence, corporate issues and the challenges of the UN. He also shared– and I observed first-hand – how he took a proactive approach to maintaining strong team morale and performance by being as engaging, accessible and supportive as possible. I was pleasantly surprised at how well the Ambassador and I got along – which helped, as I asked him a lot of questions! Crucially, he told me about his own career history, how transferable influencing, policy and strategy skills are, and how what I had observed at the UN can be readily applied to and benefit my current and future Civil Service roles, because the ability to engage at an international level will be increasingly necessary. He also welcomed my feedback on corporate issues and on the work-shadow itself, which was mutually beneficial. There was even time to enjoy a summer party, a team quiz and watching the General Election result at the Ambassador’s residence, along with nearly a hundred fellow Brits in the UN system! I was delighted to be shadowed by Zamila in New York. I learned a lot talking with her about how we each do our jobs and would encourage anyone interested to approach leaders to request shadowing - and I'd encourage the leaders approached to say, yes! I spent one day with the Deputy Head of Agency and SMT at UN Women – the newest UN agency, with a mandate to accelerate empowerment of women and gender equality. I learned about their strategy to tackle the challenges women face across the world, their mapping exercise of all UN programmes by gender impact and how to ‘hold to account’ and partner with UN agencies. I also attended a conference on female genital mutilation (FGM) and watched a very moving documentary film about an African-American woman’s personal mission to eradicate FGM in The Gambia. All in all, my work-shadow was an intensely exciting, informative and valuable experience. So much so, that I wanted to write this blog as my call to action to encourage everyone – including colleagues from minority groups - to proactively seek out development opportunities, including shadowing senior colleagues in other parts of the Civil Service. Don’t be afraid to ask for help – you’ll be pleasantly surprised at how willing Senior Civil Service leaders are to help develop your skills by sharing their expertise. For them, supporting strong development opportunities such as work-shadowing are about living up to the Leadership Statement, to be inspiring, confident and empowering, enabling us all to help to realise the vision of A Brilliant Civil Service. Where next for me? I will be work-shadowing the Cabinet Secretary himself in the autumn – onwards and upwards! All joking apart, it sounds like a wonderful work experience/job shadow. I mentored a senior Civil Servant myself and spent wonderful trips to Whitehall London to visit. And we both got a lot done too, producing BSL videos for deaf customers advising how to claim benefits and so on. So i do know how beneficial this is. Very many congratulations on a wonderful opportunity! Congratulations Zamila on what sounds like a fantastic opportunity. Hopefully, you would have discovered that life in the Diplomatic Service is far from the Ferrero Rocher image that is shown in the TV adverts and that the reality is that you are on call 24/7 and that you have sometimes have to work outside of normal working hours! This is amazing! As an ethnic minority myself, this would be something I would be really interested in myself. I am quite new to the Civil Service but I am extremely aware and attentive of the fantastic opportunities the Civil Service provides. Any advice on how to get these types of opportunites would be gratefully appreciated! Wow! I had no idea that we could shadow leaders abroard as well. The whole exprience sounds amazing and eye opening. I was particularly suprised at how much of the Ambassador's was open to you. Thank you for sharing, very inspiring.